Old Logs, Bad Logs or Common Checking? With all or the log and timber framed homes that I have the pleasure of inspecting, it is common for folks to ask about the condition of the logs or timbers. The most common question I get has to do with the large horizontal splits in the logs which are commonly mistaken for cracked or damaged areas of the logs. This is part of the natural drying process of logs! The checking as it is called does not impact the structural integrity of the log, but depending on the location, size and or depth of the checking water seepage can become an issue. With severe checking we do recommend sealing with an approved flexible sealant. This is a good example of chinking and end logs that are checking. At this stage not much is needed. Just monitor over the next season to see if the checking increases. With it being located on the bottom portion of the logs, it should not be an issue. This is an example of chinking with round end logs. This is a flexible chinking compound. Now how do you know the difference between weather damage, rotting, insect damage and checking? Once you see them side by side it is easy to distinguish. This is a picture of weather damage and insect damage on timbers that are around 200 years of age. Many times checking if it is exposed can collect water and lead to more problems. The chinking used on this cabin is a concrete mortar type. It has actually helped to speed up the deterioration that we are seeing in this photo. The key to log lasting logs is to maintain them with a penetrating stain or finish which seals and protects the logs from the elements and deters insects. If the logs/timbers have chinking (the material that fills in the space between the logs/timbers) this needs to maintained. Never use concrete mortar mix or similar products, but use a modern flexible chinking. Most are silicone or acrylic based and will fill in all of the gaps and cracks between the logs creating a weather-tight seal to help with heat loss and air infiltration. The old mortar based chinking that we still see absorbs water and does not allow for proper drying of the spaces. This leads to and increase in water seepage and damage of the area. The brands of Chinking we like are called Perma_Chink and Big Stretch and Log Jam by Sashco. Trace Inspections inspects more log homes than any other home inspection company in Tennessee and in the region. 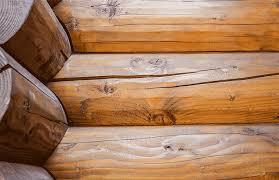 Let Trace Inspections Inspect your next Log Home. 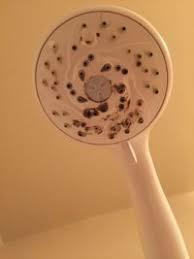 Do you know what is coming out of that showerhead, other than water? ​I noticed that every time I took a shower at my home I would almost always start coughing during and after the shower. After I was finished with the shower my coughing would lessen and I would seem to get better. I also noticed that when I was out of town and staying in a hotel that I seldom coughed when taking a shower. Now, I’m not a rocket scientist but it does not take one to figure out that the shower was the common denominator in my coughing. 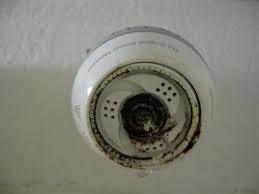 After looking at the shower head I noticed black and green slime inside some of the showerhead holes and then after spraying it with a household bleach I noticed the slime (mold) disappeared. Now showerheads are not expensive and can be replaced for under $20 for a simple showerhead. So, after a trip to the local hardware store I had a new and mold free showerhead installed in my shower. Guess what? The coughing attacks are no more! It was as simple as replacing our 10 year old showerhead. I honestly feel that my overall health has also improved and with an $18 showerhead. So, if your showerhead has any signs of abnormal growth or deposits on it, go ahead and do yourself and family a favor and replace it. They are simple to replace, and the rewards can be great. So you are buying a home with Stucco or EIFS on it! So, you are buying a home and it has EIFS or Stucco on it and you need a home inspection! You might be wondering what is EIFS? Well EIFS is the acronym for Exterior Insulating Finish System or artificial stucco. What you might not also realize is that around 10% of home inspectors will not inspect this type of cladding as part of a normal home inspection and disclaim it! Then you are forced to hire a second inspector that is qualified and able to inspect the cladding (stucco/EIFS) on the home. A special Stucco/EIFS inspection only can cost as much if not more than some home inspections. But if your inspector can inspect systems like this the overall fee will normally be just a little more than a basic home inspection. What is so different about Stucco or EIFS? The major issue is that moisture(water) can seep into the walls of the home and cause extensive damage. This normally happens from improper installation and or lack of maintenance. With most homes, everything looks normal on the interior of the home so the owner is seldom aware of what has been going on in the walls. As a buyer, you need to let your home inspector know that the home has Stucco or EIFS on it before you hire them. With around 10% of all home inspectors having the ability to inspect this type of exterior cladding you must ask them if they are knowledgeable of Stucco/EIFS. Then you need to inquire if they have the specialized equipment to inspect it as part of the normal home inspection. Hopefully they will be able to take care of the entire home during the inspection. If not, then you need to keep looking for a qualified home inspector. Next time you see a water heater look for a little yellow tag that should be hanging on what is called the TP relief valve on the side of the water heater. This yellow hang tag tells about this valve and how it should be tested and installed on the tank. It is one of the most important safety features on a water heater. Properly installed and maintained this valve will help to keep you safe if your water heater decides to go haywire. The following PDF is one of those little yellow tags along with a good deal of information about the valve, it was produced by a company that makes a device to help prevent improper connections of the required drain line to the valve . For those of you that have a fireplace and chimney, when was the last time that you had it inspected? It's one of those things that folks just do not think about until they have a problem, that same can be said for septic tanks and that will be a topic for another day! Homes generally have a masonry chimney flue or a metal fabricated flue. The modern or more common masonry flues are usually lined with a terra-cotta tile liner which provides a smooth solid surface for the smoke/combustion gases to escape. The metal flue is usually fabricated in sections and assembled with interlocking sections forming a smooth solid surface as well for the smoke to exit the chimney. Regardless if it is masonry or metal they both need to be maintained, they are not maintenance free! I'm going to address two of the most common problems that I find with chimneys. When wood is burned, more than just smoke goes up the chimney. Creosote is deposited inside the chimney lining. Creosote is a black or dark brown tar, and soot is a fine carbon powder which colors smoke. The combination of creosote and soot is usually what is referred to as creosote in the chimney. 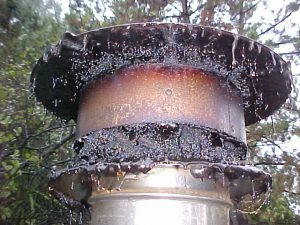 There are several forms of creosote, they are all dangerous because they are flammable and can cause chimney fires. Every year, many thousands of house fires are caused because of dirty chimneys which haven’t been properly maintained. This is why it is so important to have your chimney cleaned and inspected by a qualified chimney sweep on an annual basis if you use it often. The following pictures are chimneys with creosote problems! A tile lined chimney with a heavy buildup of creosote. Major fire hazard that is just waiting for a spark to ignite the creosote. Metal chimney with one of the worst cases of creosote buildup I have ever seen. The entire metal flue had to be replaced on this home. The top of your chimney structure is called the chimney crown the flue pipe is surrounded by the crown. If you have a chimney cap, which is recommended it will be on the top of the flue pipe. If a masonry chimney crown becomes cracked, it needs to be repaired so that moisture doesn’t get into the chimney system. With a metal fabricated chimney you will have a metal crown. While metal crowns do not crack, they do rust and corrode and have a typical lifespan of 20 years before they need to be replaced. Moisture is the largest natural enemy to the chimney system and can cause damage to the masonry, lining, firebox, damper, ceilings and walls in your home, and more. Chimney caps also protect the chimney from moisture but also keep out critters, birds and other debris. With a masonry or metal chimney the crown protects the entire chimney structure by shedding water. A good crown will keep water out of the chimney structure while a bad or cracked crown will allow water to seep into the chimney structure which can cause extensive damage to the chimney and the home. ​This is a metal chimney crown that needs to be replaced. It has rusted through and water is seeping into the home. This masonry chimney has a severally cracked crown and the cap is corroded. Be sure to look for a chimney sweep that is a member of the National Chimney Sweep Guild and the Chimney Safety Institute of America. Their members tend to be the leaders in their profession. Good chimney sweeps can keep your fireplace and chimney in good working condition for years and years of enjoyment. Tempered Glass or something else? Many times as a home inspector I come across situations where tempered glass (safety glass) should have been installed but was not. Common locations are in bathrooms, windows near a door, windows near the floor and several other locations in a home. A professional home inspection will normally advise you on those locations that are in need of safety glass. Often it is difficult to tell if a window has safety glass installed unless the etching on the window indicating that it is safety glass is visible. Sometimes the glass will have a "wave" like appearance when viewed from the side, this is from the tempering process but it is not always visible. The picture to the left an example of a window "bug" or etching. When a home inspector can not tell if a window has safety glass the normal recommendation is to have it installed or the window replaced with safety glass. This can be costly and with custom windows very time consuming, which in real estate transactions can become a problem. Recently I have become aware of a product that has been around for many years but has gained a new use inside homes. For years it has been used to keep windows from being broken by burglars and from flying objects during storms. It is called 3M Security Window Film. This specific product is called Safety S80 film. It is being used in place of tempered glass/safety glass on windows that are required to have it in pre-existing installations and in some instances new construction. Keep in mind that some local code officials are allowing its use with new construction. So instead of replacing the windows glass with safety glass this film can now be applied to the interior of the window. Before using this product, you need to check with your local code officials to see what their feelings are on this, not all of them will agree or know about this product. 3M Safety Film, Safety S80 is designed for use on the interior surface of windows. It is composed of a transparent and weather stable polyester film, scratch resistant surface and a strong acrylic adhesive. The films high tensile strength and elongation at break increases resistance of the glazing system to impact and pressure. The film also significantly reduces the transmission of UVA and UVB rays which are the main cause of fading. 3M Safety Films provide an effective protection from injuries to persons or damage to items caused the fragments of broken glass. In the case of glass breakage the fragments are held together by the strong acrylic adhesive. This film can save you hundreds of dollars over replacing the glass. It is a viable option in many situations. New home with a hot outside shower! With the building boom we have going on in the greater Nashville area we also have a boom on builder screwup's that are not being caught by our municipal code inspectors! For the most the city inspectors do a good job but they just do not have the time to look at every little thing in a home, but what I found the other day is not what I would consider to be a little problem! Water heaters have a safety device that is called a TPR, this stands for Temperature Pressure Relief valve. It is designed to keep the water heater from blowing up in the event of a problem with the thermostat or burner by discharging very hot water under high pressure through a pipe. This discharge pipe should terminate to no less than 6" from the ground so the hot water/steam will not hurt anyone. Well on this particular home I noticed that the discharge line from the second floor water heater disappeared down through the wall, which itself is not a good thing! Anyway, after a stroll around the home I could not locate the same size pipe near the ground. But about eight to ten feet above my head I did see a 2" pipe sticking out the side of the home. Surely it was not the end of the TPR discharge line! No way the city inspectors would miss this, but then we are all human. So I went back to the water heater and tripped the TPR (something that I seldom due because the valve does not always seal afterwards, but this was a new home still owned by the builder) and guess what I found! Water shooting out that 2" pipe and almost hitting the house next door! So if you are buying a new construction home do yourself a favor and have it inspected before you close on it! I'm not really sure why guys like to pressure wash everything! Maybe it is that feeling of power having 10X's the force of a hurricane in your hands, I just don't understand it. Anyway, I say all of this to issue a warning to any and all homeowners that own a power washer or are thinking of having their home power washed! DON'T DO IT! ​Just think about the force of the water that is shooting out of that nozzle. Even at it's lowest settings it will take the skin off your foot or any other body part you stick in front of it. So just imagine shooting that water at your home and then imagine all of little nooks and crannies that water is going to find. You are shooting water into areas you don't want it to go! ​Some claddings (siding material on the exterior walls of your home) can take the force of a pressure washer a little better than others. Brick holds up fairly well, but it can still be etched and damaged. Vinyl siding can be stripped off the side of a home and if you have Hardy Plank or any other cementious siding , it can be split and delaminated. Forget wood, unless you want to strip the paint right off the planks! As for Stucco or EIFS (artificial stucco), don't even think about power spraying a wall clad in stucco or EIFS. You will strip off the finish coat in seconds! If you want to clean your home, you can purchase several different house washing products. Most come in a plastic bottle that you attach to your garden hose. It sprays a chemical (similar to household bleach) with other surfactants in it to help remove the dirt and grime. You let them sit for a few minutes and then spray it down with clean water from that garden hose. NO POWER WASHERS!! So what is one to do with that fancy power washer you now have? How about cleaning the driveway! But, be careful if you have exposed aggregate! Again too strong of a stream and you will strip those little stones right off… Another option would be to sell that spraying beast on Craig's list or have a garage sale! Scott Patterson specializes in Stucco, EIFS and AMSV (Faux stone) inspections through out Tennessee and the South. Call 615-302-1113 if you have a question or need to setup an appointment. The Strange and Unusual Finds of the Home Inspector! Every year I get several request for photos of strange items I find while doing inspections. 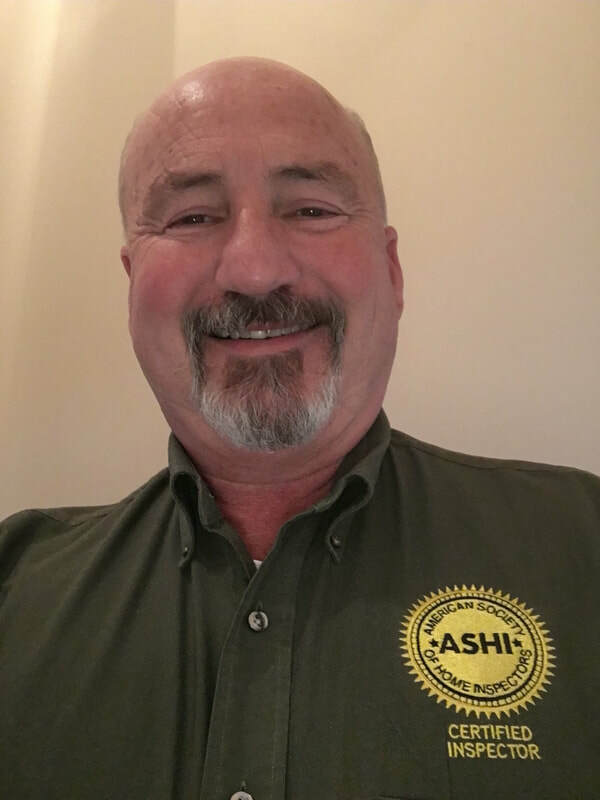 ASHI has a great source for the strange and unusual inspection finds by inspectors from all across the country. Postcards from the Field has been sharing the strange and unusual for many years. Take a look at Postcards from the Field and enjoy. Every issue of the ASHI Reporter will have several Postcards from the Field in it. Just check each issue for some great photos in addition to some very informative articles.